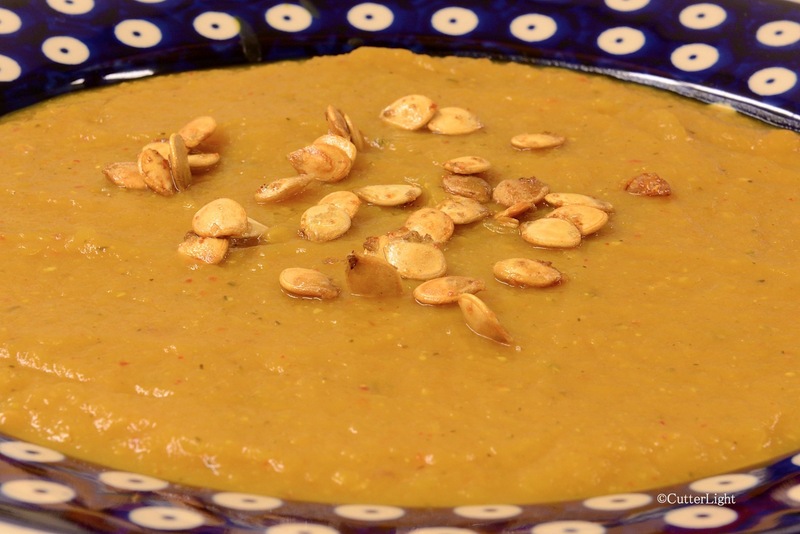 Spicy, tasty fall soup made from delicata squash skin and all and topped with its own roasted seeds. Delicata squash was new to us this year. After roasting the first one with garlic and enjoying the second one in this soup, this squash has made it to our favorites list. The beauty of delicata squash lies not only in the warm, autumn color palette of its skin, but also in that the entire squash can be eaten. The skin is tender enough that when cooked it can easily be puréed, giving the soup colorful little fall-colored speckles. Although the seeds are small, they roast perfectly to complement the soup. The roasted seed recipe would work with any squash or pumpkin seeds, and any leftovers make a delicious snack or salad topping. Place squash, cut side down, in about 1/2 inch of water in a roasting pan. Cover pan with foil. Bake squash until tender, about 45 minutes. Remove from oven and let cool slightly. Chop into 1-inch cubes. Sauté onion and celery in butter over medium heat until softened, about 10 min. Stir in squash, broth, peppers, and salt. Bring to a boil. Reduce heat to low and simmer until flavors blend, about 20 minutes. Blend soup with an immersion blender until smooth. Stir in brown sugar. Simmer for 5 more minutes. Pour into bowls, top with roasted seeds and enjoy with slices of freshly baked bread. Clean seeds in cold water to remove squash strings and bits. Pat seeds dry with a towel. Place seeds in a bowl and stir in olive oil and salt until all seeds are well covered. Spread seeds on parchment-lined baking sheet. Bake for 15 minutes or until seeds start to pop. Cool on baking sheet until ready to use. Seeds will remain crunchy in an air-tight container for several days. Thanks, Claudia. It’s a good basic recipe for other squashes and pumpkin, too.